This make your own compost tumbler bucket is perfect for small spaces or small families. Compost is wonderful for gardens and great for the environment, you will have less waste in the garbage and nutrient rich soil for your plants. 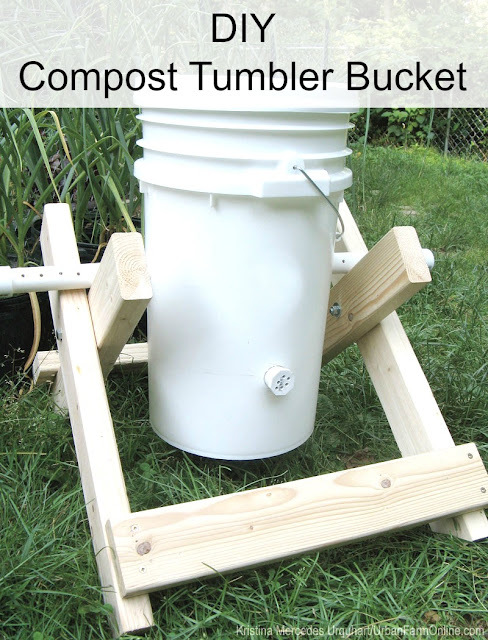 You can find pallets or used wood to make the frame for free, then you just need the 7 gallon bucket (you can use other sized buckets as well, be sure your bucket didn't contain any materials previously that you wouldn't want in your food) and some PVC pipe and materials. This is a great project for anyone but you will need a bit of experience with power tools etc.